CYBER MONDAY SALE at POP ART DIVA GIFT GALLERY! 60% OFF ALL POSTERS & CANVAS PRINTS! 50% OFF ALL CHRISTMAS ORNAMENTS! 50% OFF ALL CARDS, POSTCARDS & INVITATIONS! 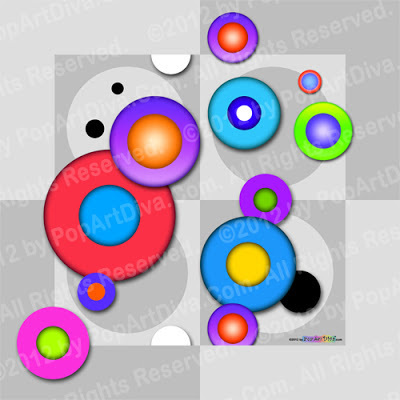 I've been wanting to start a series of abstract, non- representation designs for my on-line store, The Pop Art Diva Gift Gallery, for a while. I love doing art that relies only on the elements of art - color, form, design, movement, balance, texture - and not on "looking like" something. I was watching FIRST WIVES CLUB again just recently and the opening credits were presented in a really fun, retro pop art animation and one of the last parts were these bright circles that swirled across the screen and that inspired this RAINBOW CIRCLES design. Yes, I really do get my creative inspiration from everywhere! I hope to do a series of these non-representational designs in the upcoming months and am looking forward to playing with art for art's sake! As always my designs are available on a wide range of products and gifts - all fully customizable on Clothing (including t-shirts, hoodies and ties) to Home Decor (including cups, pillows, bowls, plates, pitchers, napkins and more) to Stationery (like envelopes, letterheads, labels, business cards, greeting cards and invitations) and even Games (playing cards, puzzles and dart boards). Below are the products available with my NEW RAINBOW CIRCLES ART - just click on whatever interests you and you'll click right over to that product page! These cats were inspired by a three dimensional painting/sculpture I did some years ago where I had three cats trucking off to the left (similar to the cat on the left here) and then one cat with a little wavy tail who headed to the right. That little wavy tailed cat going off in a different direction from everyone else is pretty much how I see myself, lol. Trust me not to follow the crowd - and to be the oddball with an attitude on top of it! 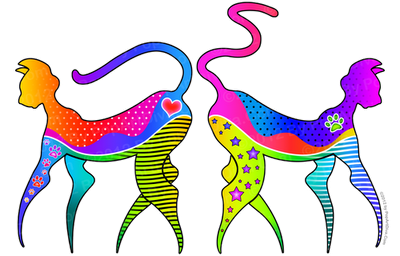 Kitty Cat Katz is available on a range of products, gifts, apparel and art prints at The PopArtDiva Gift Gallery so check it out! P.S. I also did each cat as an individual design just because I could! 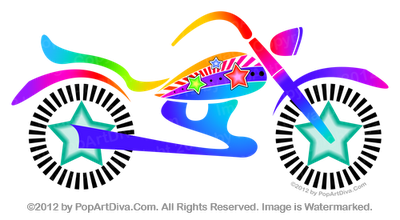 I wanted to do something that was very stylized that could cover the gamut of motorcycles out there. I think the gas tank and the seat look like a chopper, the fenders look like dirt bikes and the headlight looks like it's off an old 50s James Dean style bike. Now that I've done a motorcycle I want to do a car or two - first I'm thinking of redoing an old hippie bus, then maybe some kind of cool classic car. I'll let it mull around in the back of my mind.